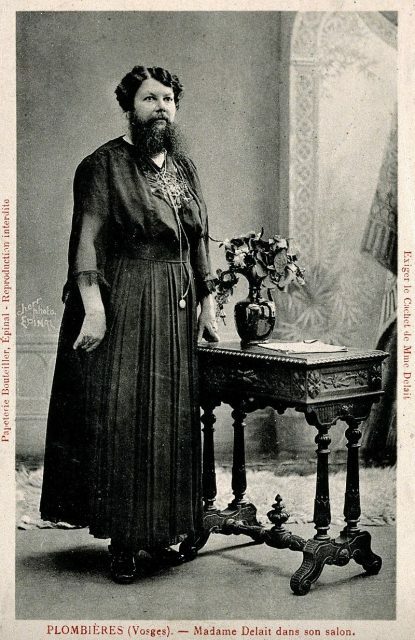 Clémentine Clattaux Delait, born on March 5, 1865, in Chaumousey, France, became one of the most famous bearded ladies of the late 19th and 20th century in Europe. While her fame and story faded over the decades following her death, Delait was rediscovered when a second-hand collector purchased her private memoirs at a garage sale in 2005. Delait’s 50-page memoir included fascinating photographs, press cuttings, and detailed accounts of her life as her popularity grew. Delait married a local baker in 1885 and opened up a café and bakery in Taon-Les-Vosges, located in northeastern France. 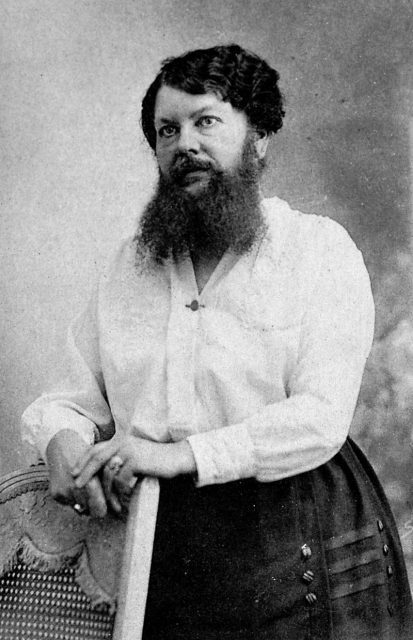 Delait, who shaved her face every day, had never considered growing her beard out. In her memoir, she described the time she went to a carnival in Nancy and left unimpressed with the bearded lady she visited. 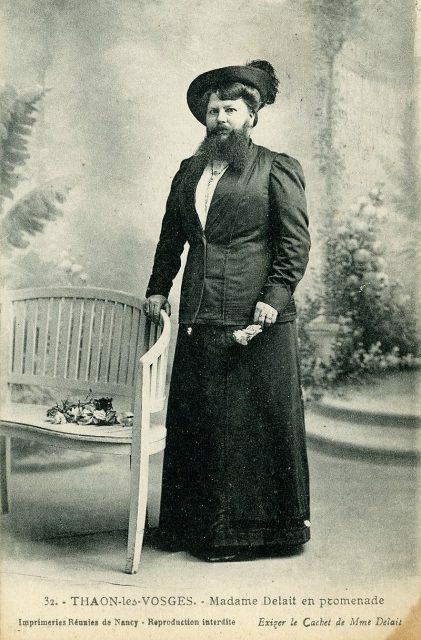 After returning to work at the café, and knowing she could grow a better beard, she made a bet with a customer that would change her life — and image — forever. “The success was immediate…they were all crazy about me,” Delait stated in her memoir. 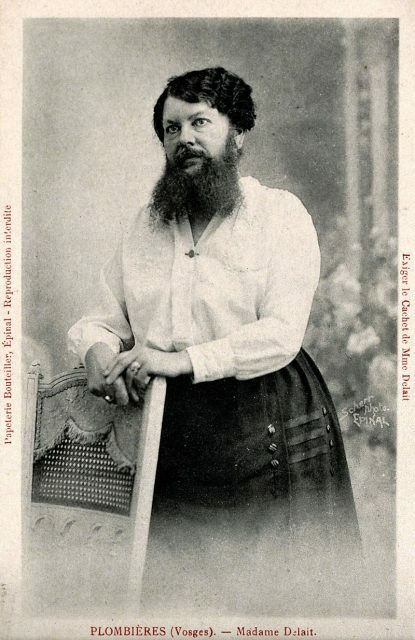 Feeling inspired by the rising attention to her new look, Delait renamed her café as “Café de la Femme Barbe” (Café of the Bearded Woman). 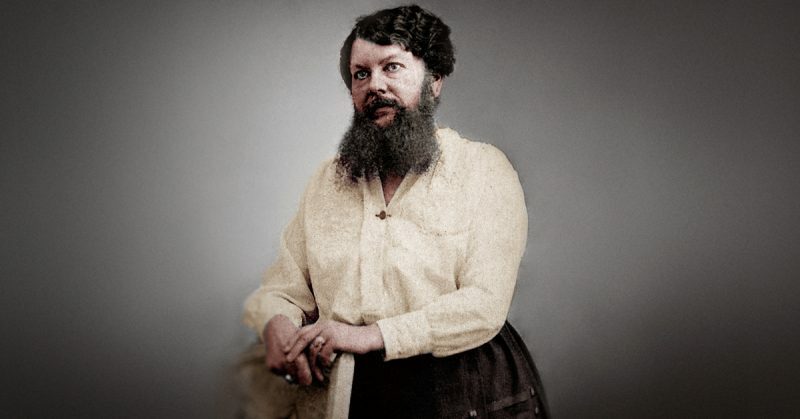 Along with the name change, Delait and her husband began selling souvenirs, picture postcards, and signed photographs of Delait sporting her beard. By this time, people and the press from all over Europe were regularly visiting Delait’s café to meet her. Invitations were pouring in, begging Delait to take part in overseas exhibits and carnivals. Although she was flattered, Delait took too much pride in her café to leave and was too devoted to her husband, especially when he became weak in health. As time passed and with the success of her café, Delait pursued other hobbies and interests. During the Great War she worked as a volunteer nurse, regularly took part in outdoor cycling, and was a dog lover. 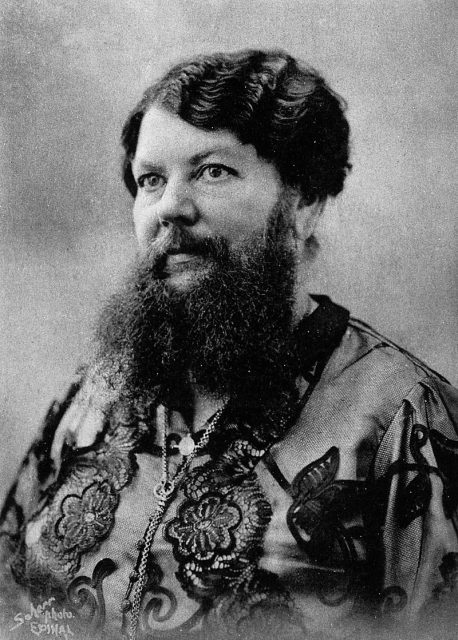 Possibly the same medical condition or hormonal imbalance that resulted in her ability to grow a beard, Delait wasn’t able to conceive children of her own. After 30 years of marriage, Delait and her husband adopted a 5-year-old girl who lost her parents to a Spanish flu.